All BOSE single channel amplifiers have a Lifetime warranty, multiple channel amplifiers and car stereo one year. There is confusing and conflicting information on this Bose Audio system, both from the dealer$hip and on the internet. See our Videos on the stereo and Audio Finisher problems for help. 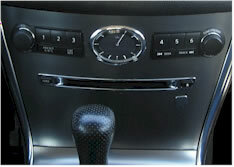 AC and stereo controls do not respond, steering wheel controls may work. Stereo does not power on or no display. Current draw causing dead battery. Repair rate includes attending to all these problems and others while stereo is in shop, $250. Add Direct Audio Input, for iPod and other audio devices, $100. CD Changer problems, jammed, will not eject or accept CD's, or CD error code FO, repair of CD changer and all above problems, $450. Troubleshooting Current Draw, dealership may $ay "BCM", however pull "Radio" fuse under hood at battery to test over night. If battery is good, send stereo for repair. 2) Non-Bose car stereo will not tune past 90.0? 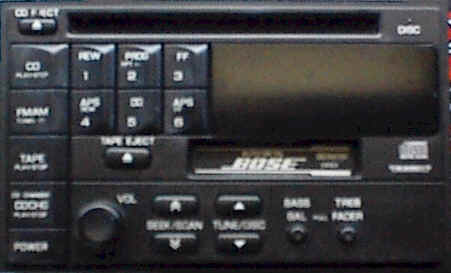 Non-Bose, look for a replacement car stereo. Infiniti G35 Bose Amplifier Sedan - bolted middle of rear deck, trunk side. Coupe - bolted to floor of trunk, driver's side, check for water damage. 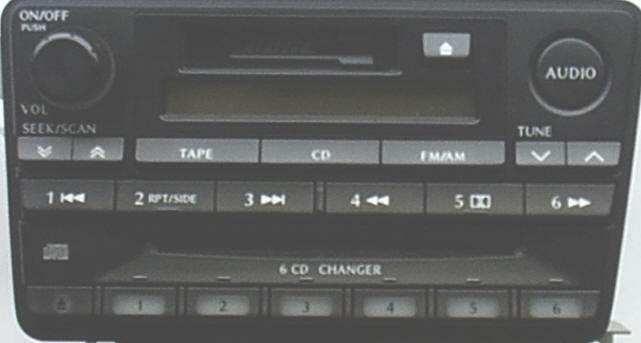 6 CD changer AM/FM/Cassette stereo. CD's jammed, will not accept or eject, intermittent CD, or CD Error FO. Remove ALL CD's from the stereo, package well before shipping. With CD's left in the changer or the stereo not packaged well damage may occur during shipping. Repair rate ranges depending on the above problems, $185-345. CD player jammed? Before thinking of repair, try disconnecting one of the battery terminals for several minutes then reconnect. This may act as a "Reset" and bring the changer back to working condition. Otherwise, repair is needed. See our Shipping Form before sending for service and repair. 6 CD Changer, CD does not work, channel out over bumps or intermittent on CD only, CD Error FO, are some of the most common problems, repair is $295. Subwoofer no or intermittent audio, $85-135. See our removal instructions. Subwoofer is intermittent or does not work, $85-135. 6 CD Changer, CD does not work, channel out over bumps or intermittent on CD only, CD Error FO, are some of the most common problems, repair is $295. 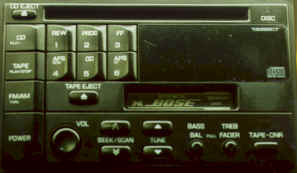 Intermittent or missing channels on radio and/or cassette. Speakers, snap, crackle and pop, loud high pitch tone, and other problems, repair rate $80 each with a lifetime warranty. 2001-2003 - 6 CD Changer, CD does not work, channel out over bumps or intermittent on CD only, CD Error FO, repair is $295. 2000 - Single CD Player, no display, CD skips, sounds scratchy, CD does not operate properly, one channel on CD out, does not work or intermittent, $165. CD's skipping - Two options for DIY repair. 1) Insert CD, seek to last track, seek back to first, repeat several times. Forcing laser to both extremes, this may clean and relubricate sled mechanism. CD's may stop skipping. 2) Try a CD lens cleaner, this may clean dust from laser. We no longer repair this CD changer. Defective or no CD, display reads Err, unit powers up with no audio, no display, no power, volume control does not work or is erratic, $165. Erratic volume control? See DIY Repair. We add AUXILIARY-IN, direct audio input from you phone. Intermittent or no CD, unit powers up with no audio, no display, no power, volume control does not work or is erratic, cassette cycles or attempts to eject without cassette inserted and may drain car battery, $175. 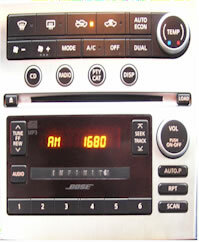 95-96 AM/FM/CASS/CD COMBO, many related problems found with these stereos. No display or intermittent. Car stereo dead, on with no sound, intermittently has sound, will not turn on, then it will turn on and work fine (for a short while, sometimes longer), no tape or ejects on it's own, tape mechanism attempts to eject without tape, no CD or a combination of these listed problems. We no longer repair this car stereo. Upgrades are available, call for pricing. 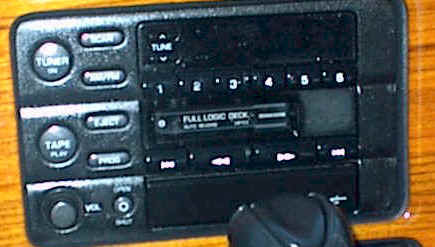 See '93-94 below for view of upgrade stereo. CD player ejects but does not play, clicks, does not eject, Err 2, CD player seems jammed, $295. No or intermittent display, push buttons on face do not work, but steering wheel controls work, $175. 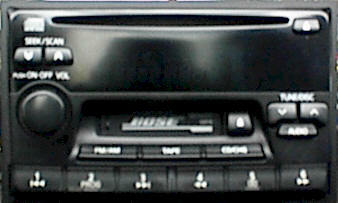 6 CD changer AM/FM/Cassette stereo. 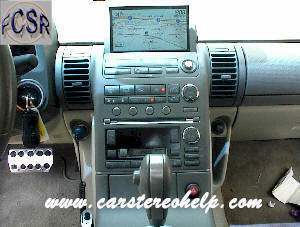 CD's jammed, will not accept or eject, intermittent CD, CD Error FO, repair is $295. CR190 / PN-2543N-B / 28188 5W900 CD player ejects but does not play, clicks, does not eject, Err 2, CD player seems jammed, $295. 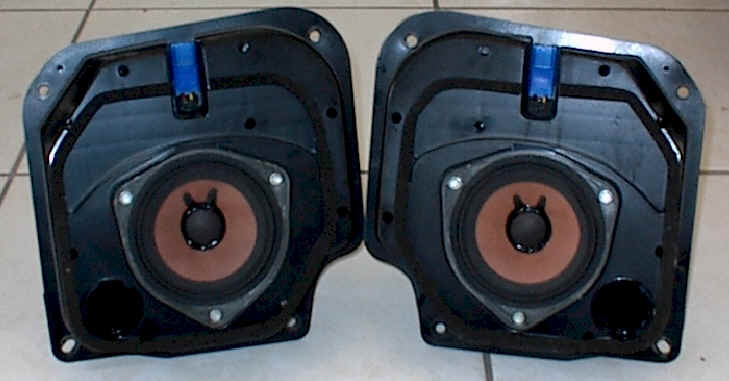 Speakers snap, crackle, pop, sizzle, have high pitch squeal, sound distorted, low or no output, amplifiers at speakers $80. Lifetime warranty on Bose amp repair. 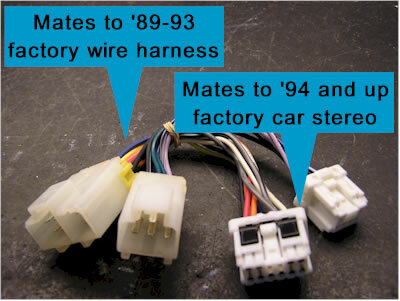 *NOTE-Check dealership for recall on Q45 rear Bose amplifiers '91-92. Q45 Front Enclosures Speakers snap, crackle, pop, sizzle, have high pitch squeal, sound distorted, low or no output, amplifiers at speakers $80. See How to remove instructions. See our Shipping page before sending for service and repair. Rumble through speakers or no output, $200 with a one year warranty. Subwoofer does not work, $85-135. See our removal instructions. EN-965F-51 Front speakers or rear speakers do not work or are intermittent. Defective amplifier/amplifiers located in truck. Both silver amplifiers are bolted to the top of the package shelf. Disconnect one or the other by releasing trigger on plug to determine which one may be defective. Repair, $85. Infiniti - Bent or broken power antenna mast, will not extend or retract fully, antenna motor runs with improper mast movement. See our "Do-it-Yourself" repair instructions. 93-96 car stereo powers up with no audio, or all speakers are on and off together intermittently with clicking sound under dash and/or power antenna up and down, scratchy volume control, $185. 91-92 tape functions incorrectly or not at all, poor audio on tape, unit will not power up or intermittent, scratchy volume control, no or intermittent display, poor or squealing FM, requires overhaul of stereo $250-300, for repair of all known problems to date. This radio takes some time to repair, turn around time on repair 2-4 weeks. Erratic or Scratchy Volume Control? See DIY Repair. CM949 / PN-9354Q-C Tape does not function properly or no audio output, intermittent audio, intermittent power, scratchy volume control, no FM, $165. 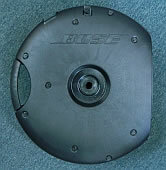 *NOTE-Check dealership for recall on Q45 rear Bose amplifiers '90-91. CM051 / PN-9556Q Tape does not function properly, no audio output, intermittent audio, intermittent power, no power, scratchy volume control, no FM, or a variety of these problems, $165. 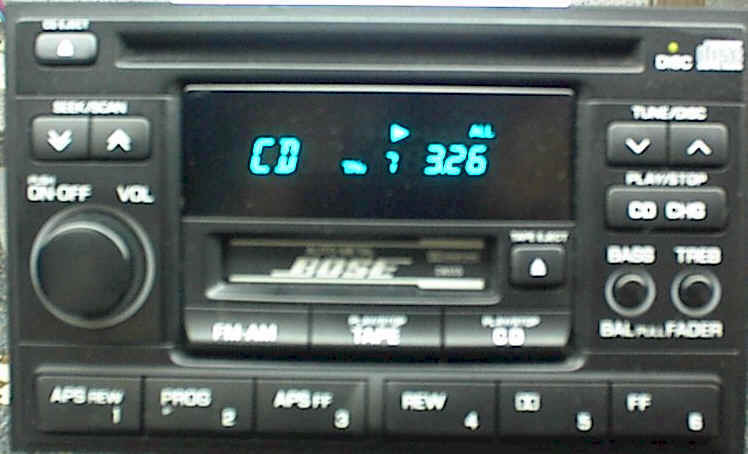 AM/FM/CD/Cassette, stereo dead, on with no sound, intermittently has sound, will not turn on, then will turn on, no tape, tape ejects on it's own, tape runs with no cassette inserted, CD display reads Err or HHH, no display, intermittent display or a combination of these problems plus others. 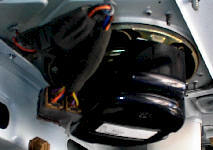 We no longer repair the '93-96 Bose/Clarion stereos. We suggest upgrading to a newer stereo. This will require a wire harness adaptor for direct plug in. Harness is available separately for purchase below. We sell Bose upgrade stereos. 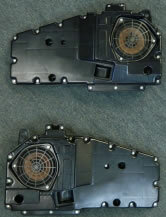 Please call for pricing and availability, includes wire harness with upgrade, and shipping costs (407)830-0777. If you have already purchased your own stereo for the upgrade, this wire harness for installation is available separately. Sony CD Changer CD shows "Err", skips, does not operate properly. We no longer support repair of this Sony CD changer. 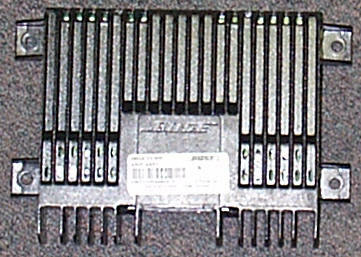 Parts are no longer available. CD does not operate properly or gives Err. We No longer repair this CD changer. Alpine supplies no technical support, service literature or OEM parts.